Yesterday, the first steel was cut for Hapag-Lloyd Cruises’ Europa 2, marking the official beginning of her construction. The cruise line’s managing director Sebastian Ahrens gave the start signal at the STX shipyard in St Nazaire, where ships such as the Normandie, the France and the Queen Mary 2 were built. With the MS Europa 2, to enter service in the spring of 2013, Hapag-Lloyd will further advance its pioneering role in the luxury sector. A total of 835 shipyard workers will be involved in the project, with an estimated 2.5 million hours of labour dedicated to the new ship’scompletion. “After an intense planning stage, we are very pleased to be taking this decisive step towards the extension of our fleet with the first steel cut,“ said Mr Ahrens. With individual parts of the ship being manufactured in different shipyard halls over the coming months, the keel laying will take place in the spring of 2012, and commissioning in the spring of 2013. 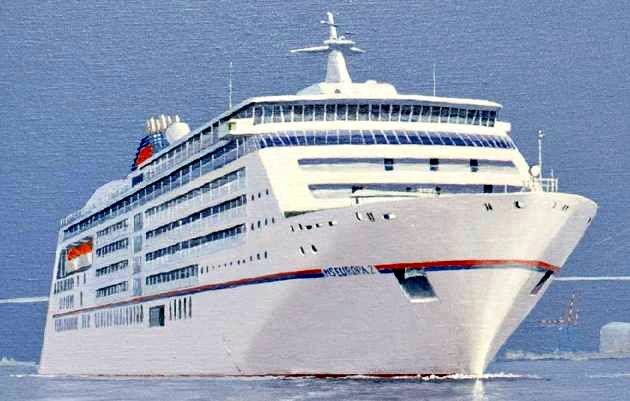 The Europa 2 will enhance the luxury segment of Hapag-Lloyd Cruises, offering a modern and informal interpretation of the existing Europa, the only cruise ship to be awarded with the highest “5-stars” plus ranking in the Berlitz Guide to Cruising & Cruise Ships. The Europa 2 will have eleven decks and will offer 258 suites. She will have a maximum capacity of 516 passengers and will boast more space per passenger than any other cruise ship in the world. Spa Suites, Penthouse Suites and family suites will complement the range of accommodations on board. Seven restaurants including a sushi bar, two lounges and four bars will enhance the ship’s culinary diversity. Guests will also enjoy a wide range of on board entertainment, a large wellness and spa area, and numerous sports and health-oriented offerings.